Network Ten is to extend the running time of its morning chat show Studio 10 by an hour, leaving it on air until noon every day. The change, which kicks off in a fortnight on July 24, will see the show run for three-and-a-half hours from 8.30am every day. It follows steady audience growth since Studio 10 launched in 2013. The extension will see the show vie with Seven’s Sunrise and Nine’s Today – which both run from 5.30am until 9am – for the title of Australia’s longest daily TV show. 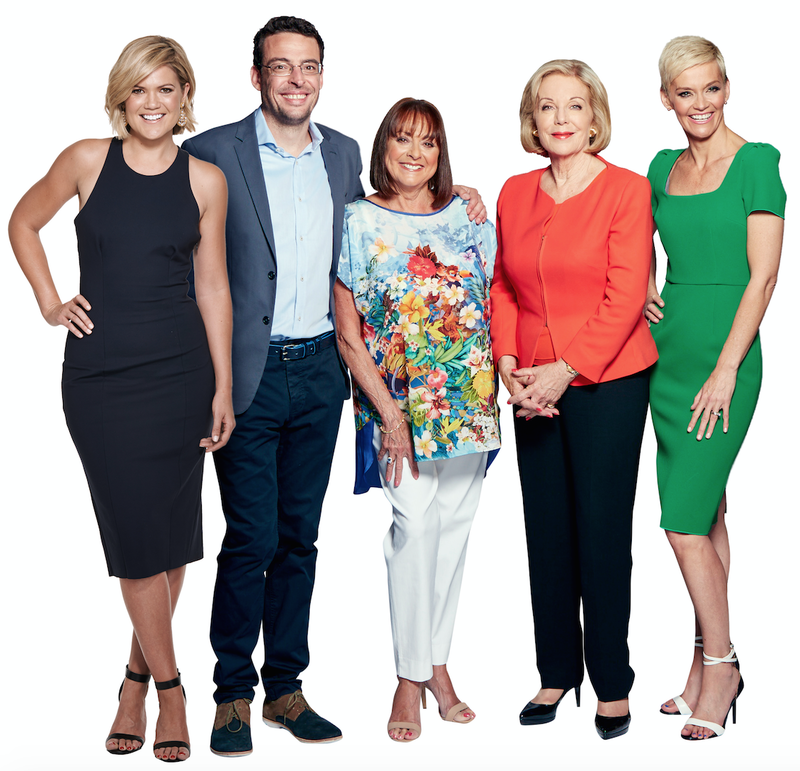 Studio 10 is helmed by Sarah Harris with a regular ensemble of co-presenters Joe Hildebrand, Denise Drysdale, Ita Buttrose and Jessica Rowe. The show also features branded content segments led by Jono Coleman, along with a series of regular guests. Although the show remains third in its timeslot behind Seven’s The Morning Show and Nine’s Today Extra, which both run from 9am to 11.30, it has dramatically closed the gap. In the key battleground of 9.30am to 11am, the show has doubled its share of the metro audience over the last two-and-a-half years from 10.5% to 20.9%. So far this year, Studio 10 has delivered an average metro audience of 94,000 for the 9.30am-11am timeslot and 80,000 for the whole program. Last Friday, Today Extra rated 136,000 and The Morning Show, which has just celebrated its tenth year on air, averaged 151,000. Studio 10 has now overtaken Ten’s previous recent forays into morning television for time on air. David & Kim, with David Reyne and Kim Watkins, ran from 2006 to 2009 and aired 938 episodes. The Circle, featuring Yumi Stynes, Gorgi Coghlan, Chrissie Swan and Denise Drysdale – who is now a regular on Studio 10 – ran from 2010 to 2012 and aired 582 episodes. Studio 10 will celebrate its 1000th episode next month. Asked where the show’s audience growth is coming from he said: “Certainly we have been taking audience from Seven and Nine, but I think we’re finding new viewers too. I enjoy Studio 10 (except for the lengthy ads) . The Panel including Robbo are great. Why not run it all day and night and call it Channel 10? Love Studio 10. The panel work really well together. I didnt like Joe much but watching him daily I have realised he is genuine nice guy. The female panel members are just fantastic. The guest panel members fit in well especially Jo Cosamento. As for Robbo what a hot hunk. Does this mean my chores will not be done till after midday. So be it. I have abandoned Channel 7 morning programs and now prefer Ch 10 with the odd foray onto Ch 9 with David Campbell and Sonia Kruger. Both of these are more entertaining and not so saturated with advertising. Sarah Harris; Yes, a strong-minded host. Joe Hildebrand; Writes for Murdoch’s Daily Telegraph. Enough said. Denise Drysdale; Yes, love her off beat humour. Ita Buttrose; God dead boring. Jessica Rowe; Yes,the spark plug panellist. Jono; Remmember him from ABC Triple J. And thats a yes. Conclusion….Morning television on Ten is …a positive. I love Studio 10 as I have also loved the circle and GMA but I think I am going to find it difficult coping with an extra hour and hope this doesn’t cause a loss of viewers. The panel are great with the exception of Jessica Rowe who lives in the stars with pink kittens and rainbows until she becomes the lightening rod of all testy lefties !!!! !